This article is part of a continuing series examining the postseason prospects of the eight seven six five four three remaining MLB playoff teams in 2013. A Vegas favorite has fallen. At 4:1, the Los Angeles Dodgers were second only to the Boston Red Sox in World Series odds at the start of the postseason (and tops in the National League). But last night they were felled by the St. Louis Cardinals in six games. For the record, Rational Pastime picked the Cardinals. In six. 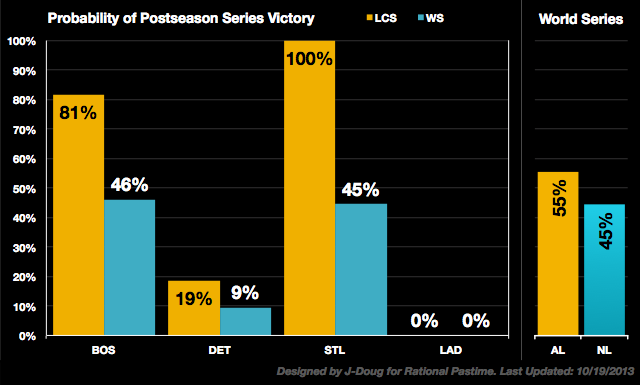 By sending the Dodgers home, the St. Louis Cardinals raised their WS% to 45%—highest of their postseason, but still short of the Boston Red Sox (who will be the favorite should they advance). The Cardinals' success was bad news for their AL counterparts. The Red Sox lost two points of World Series title probability when the best NL team made certain their appearance in the Fall Classic. The Detroit Tigers lost a point as well. 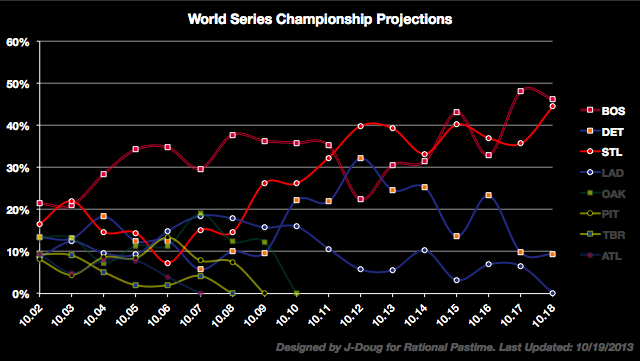 Check out series breakdowns, ratings updates and likely World Series outcomes after the jump. Keep reading for an explanation as to why my rating system disagreed with Vegas, and why I was pretty sure I was right (this time). First things first: the Cards won in six. This carries adverse consequences for the Dodgers' World Series hopes. As noted in yesterday's post, we still expect the Sox to represent the Junior Circuit in the World Series. The Tigers have a decent chance of advancing should they force a Game 7. 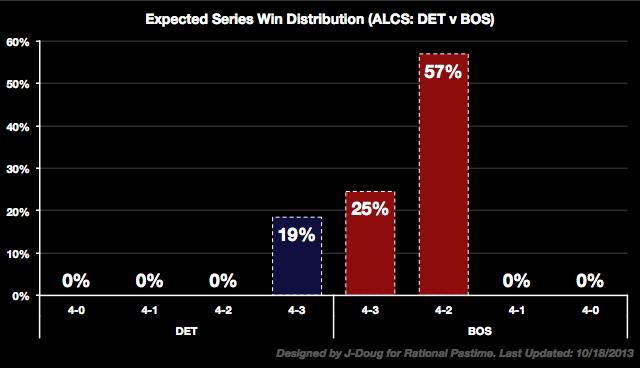 The top two likely World Series outcomes remain the same: Boston over St. Louis in six or seven. The stability of these projected outcomes speaks to the internal stability of the Rational Pastime projection model. With their win, the Cardinals passed the Tigers to return to the #2 spot in the Elo-based ratings system—and opened up quite a gap. The ratings system explains why my projection system picked the Cardinals over the Vegas-favored Dodgers. On October 10, prior to the start of the NLCS, the Cardinals enjoyed a substantial lead over the Dodgers in both Elo rating and Pythagenpat expected win percentage—the two components of the rating system. 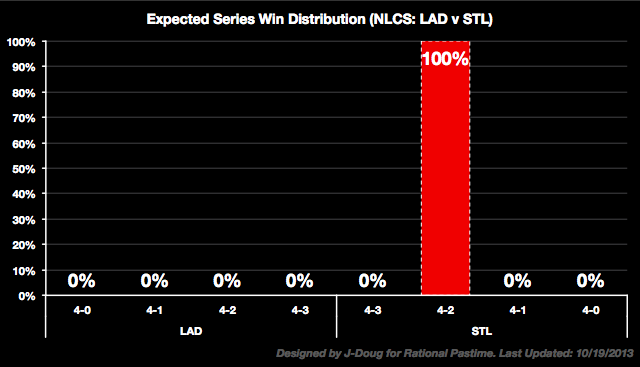 As the NLCS began, the Cardinals led the Dodgers in Elo AVG by .016 and in Pythagenpat AVG by a substantial .058. Weighting expected winning percentage at one half of Elo rating, this gave the Cardinals a lead of .034. Combined with home field advantage in a seven game series, this put St. Louis in the driver's seat. So why did Vegas pick the Dodgers? First of all, let's be clear that they were only slight favorites over the Cardinals (4:1 vs. 5:1 at the start of the postseason). Second of all, the Dodgers have Clayton Kershaw, and an ace's impact is even bigger when the rotation shrinks. Clearly, Vegas did not expect the same out of Michael Wacha (nor should bettors have been expected to). Third of all, the Dodgers' final record is a result of an historically great midseason performance, a very good late-season performance, and a horrendous early-season record. Their good work late doesn't obviate their early struggles. I suspect there was some recency bias on behalf of those putting the money down on LA. To be clear, I don't expect this rating system to beat Vegas most of the time, but I did expect that I had one on bettors in this particular series. The results bear this out. Check in tomorrow following tonight's elimination game between Boston and Detroit to check out the updated ratings.